My children are my jewels, too. They are God’s precious gifts to me. They are the expression of His love and goodness. With them, my heart is always full of gratitude to God. They are God’s instruments of His love for me and me to them. When I was a lot younger and I could not imagine having children of my own yet, I had a friend who would always invite me to visit Jesus in the Blessed Sacrament and the Blessed Mother every afternoon. Every day after school hours, we would walk going to the church and there would say our prayers. We would bring with us flowers and candles which we lit as we sang a hymn to our Blessed Lady. My friend would tell me that the Mother of God is happy to listen to our song. This friend of mine became a Carmelite Sister. I did not understand much about vocation to the religious life. For me, it was enough that I had the devotion to the Blessed Virgin who brought me closer to her Son. I have not seen my friend up to this day but I was told that she is very happy in her chosen life. I thank God for her because she has been instrumental in strengthening my devotion to Mary, who is my refuge at all times, and have a special attachment to her as I was born on the feast of her Assumption. When I got married, I realized that my own family was my vocation. My husband was also a devotee of the Blessed Mother. His was born on the feast of Our Lady of Lourdes. What a coincidence! We were both lovers of Mary. We entrusted ourselves to her and our future and she did not fail us. She protected and guided us and brought us all to Jesus. God has blessed us with six beautiful children ‘three boys and three girls. We introduced them to Jesus and Mary. We entrusted them to their care. We would pray the rosary as a family before going to bed and occasionally, at dawn. We attended Holy Mass faithfully. We encouraged our children to join church activities and organizations like the Legion of Mary, or the Sodality. I have always wanted them to be very simple and be always grateful to God for everything that He provides. All I wanted for my kids was for them to be good children, responsible citizens and faithful Christians. As they were growing up, I would tell them especially my girls to pray the Hail Mary whenever they would feel afraid and could smell danger because I was sure that being a mother herself, the Virgin Mary would protect them. And she did her part very well! My husband and I owe much to her assistance and we are grateful that we have successfully accomplished our responsibilities to our children. The boys are happily married and we are happy to see our grandchildren. When my daughters expressed their desire to become religious, there was a slight resistance from their father. However, I managed to convince him that we must leave it to the Almighty to decide, whether He wanted them or not. Things must happen according to His will, not ours. Well, I can say now that God’s divine plan had prevailed. My two daughters entered the convent within a short interval; and my youngest joined them seven years afterwards. I am indeed very grateful for the gift of my children and more so for the gift of their vocation and their courage and strength to respond to the call. I never thought of my girls joining the religious life. This is such a great gift from God. He is so generous and so full of love. When they were young I had always prayed that if God wanted them to get married, they might be blessed with loving husbands like their father. And the Lord is giving them more than what I have asked for ‘Christ himself, the precious gift of all. I continue to pray for my children, especially for their perseverance. My they be courageous and strong at all times and be attentive and faithful to the Lord’s presence in their lives. May they always have the enthusiasm to love and serve Him joyfully. By giving my three daughters to God, I did not lose them; they are always with me, just as I feel my husband close to me, after he left me for the eternal home in 1999. I have experienced and am still experiencing the Lord’s ever abiding faithfulness to my family. I am grateful to God for having given us, my husband and I, and my three boys the generosity to accept the will of God as regards their sisters. As I look back, I cannot help but marvel at God’s graciousness to my family. My daughter’s way of life inspires me to serve Him with gladness, too, in my community as a member of the Handmaids of the Lord in my parish. I continue to bless the Lord for having chosen my children to serve Him in a very special way. My heart overflows with gladness and gratitude and I humbly thank the Lord for His graciousness to my family. I fervently pray that He may help all my children to always do what pleases Him. May His will be done! The Alarcon family is from Goa, Camarines Sur. 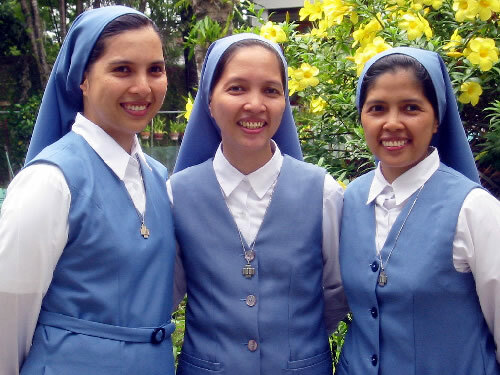 Mr. and Mrs. Jose and Asuncion Alarcon have offered all their three daughters to become members of the Congregation of the Daughters of St. Paul. Sr. Mennen entered in 1992. Like her mother, she was a teacher by profession. One year later, her elder sister, Sr. Bing, an accountant, followed. 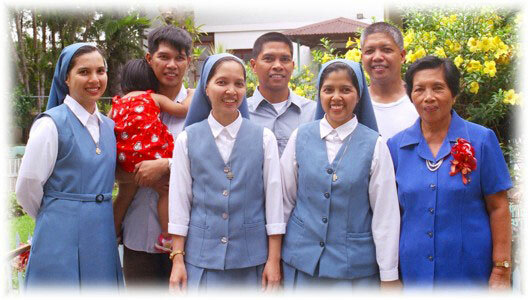 Seven years later in 2000, the youngest daughter, Sr. Deedee, also a teacher joined her two sisters. All three of them are much gifted and talented children of Mr. and Mrs. Alarcon, and could have been successful in the world. Yet, they have left the world to follow Jesus Christ, putting their giftedness and talents at the service of God.